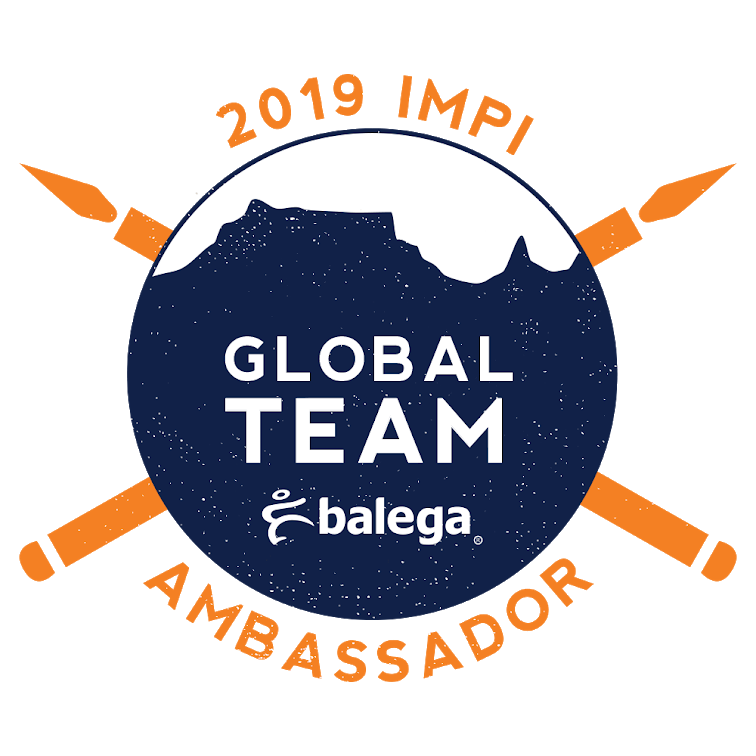 It is our tradition to climb up Table Mountain every year… it all began a number of years ago when one of the hoods declared a dream to climb to the very top. And so began our hiking career. 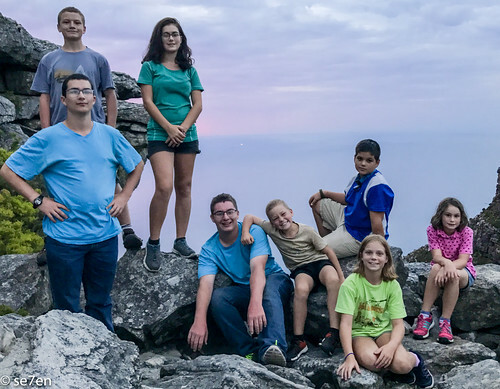 Towards the end of last year our gang worked really hard on a nature observation project, and won a guided overnight hike on Table Mountain, thanks to our homeschooling group at Cape Point Nature Reserve. 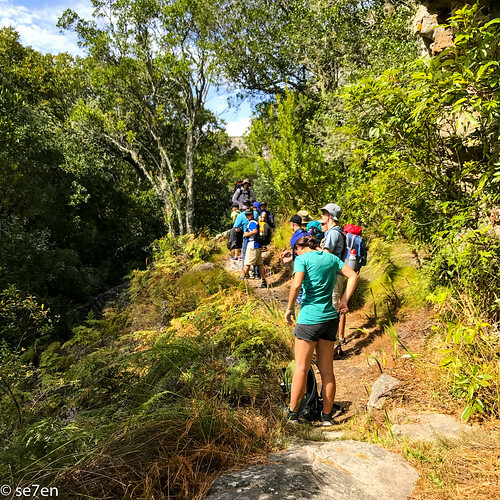 So this year’s annual hike up Table Mountain was way beyond any of our wildest dreams as we headed out with a couple of friends on the People’s Trail, under the watchful eye of Justin Hawthorne of Table Mountain Treks. 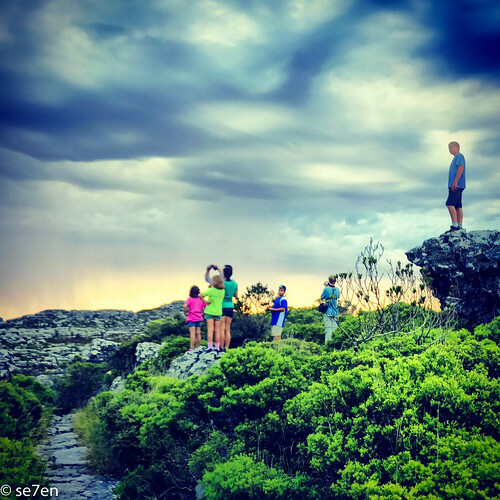 The People’s Trail on Table Mountain is an overnight hike, that was developed as a trail to bring the mountain to the people of Cape Town. 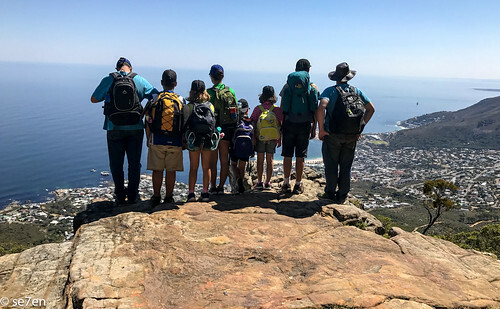 School groups and local hiking groups from previously disadvantaged areas that would not have had access to Table Mountain and have been invited to have a Table Mountain experience. The route of the hike follows part of the popular Hoerikwaggo Trail. 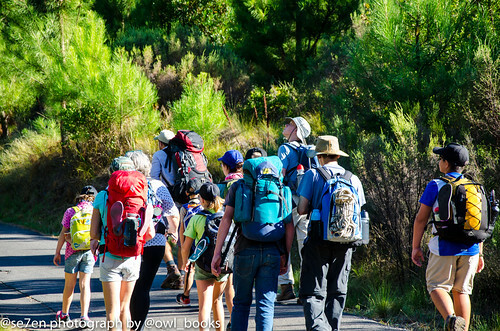 This hike can only be done by booking a permit with SanParks and with a dedicated ranger to guide you through it. The purpose of the ranger is not only to keep you safe and on the route at all times, but to teach you and educate you about the environment that you are walking through. 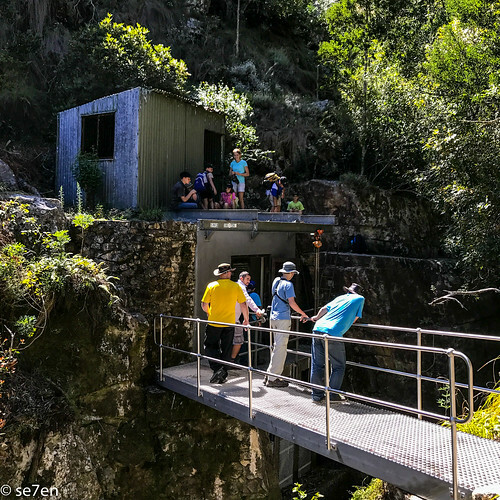 The route begins at Constantia Nek, takes you through Orange Kloof, up Disa Gorge to the Woodhead Dam, where you overnight at the People’s Hut. 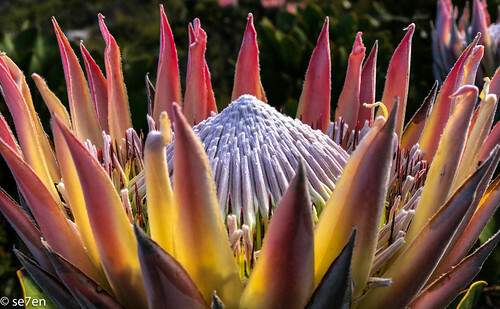 On the second and final day of the Trail, you head to the highest point of Table Mountain, Maclear’s Beacon at 1084.6m, and then across the mountain top towards the Cable Car Station and down Platteklip Gorge to the Finish. He knew the good places to take a break, where to find a trickle of water in the middle of a drought, he knew so much about the route… when to take it easy and when to keep moving. Apart from his obvious knowledge of the surrounding area he was happy to get all our kids from start to finish safely, while the father person and I were trailing after the galloping enthusiasm that is youth. 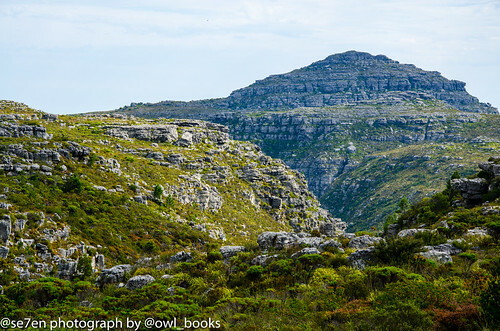 A lot of folk underestimate Table Mountain, because it is surrounded by a city and millions of visitors head up it each year… the fact it is a wild wilderness area, the weather is changeable, the routes not always clear. Having a guide with you takes away all the “safety” stress. You know you are on the right route, you can ask, “Are we there yet?” and get a realistic answer, which is great. 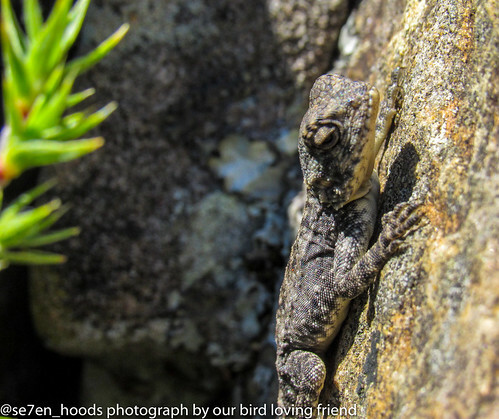 There were also one or two folk on the mountain top that I would have been wary of had I been hiking on my own, but with the ranger there to encourage folk, who were intending to illegally overnight in Rendezvous Cave, to move along we felt completely safe. The huge advantage of hiking with a guide is the font of information they carry with them… they may take you on a little walk off the track and show you a feature that you never imagined was there. 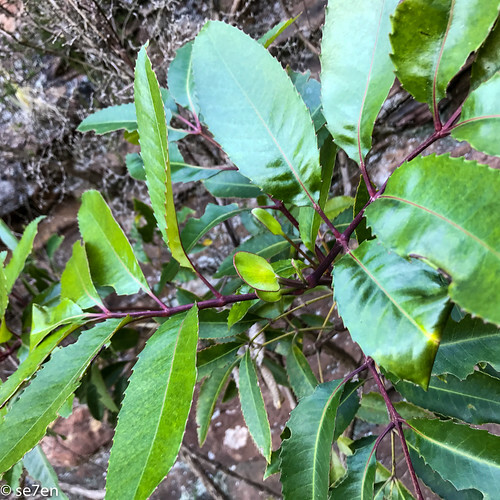 This is a butter spoon tree, look for the little spoon! 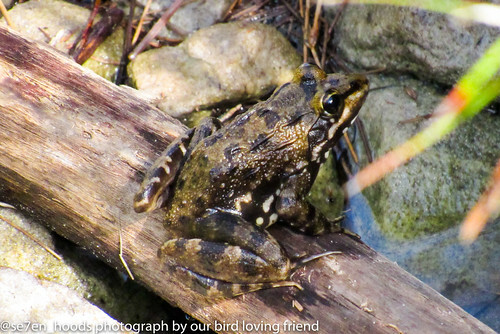 We know things about the plants and traces of wildlife that we saw along the way that we could never have gleaned for ourselves. And the local history, which we happened upon as we hiked was fascinating. 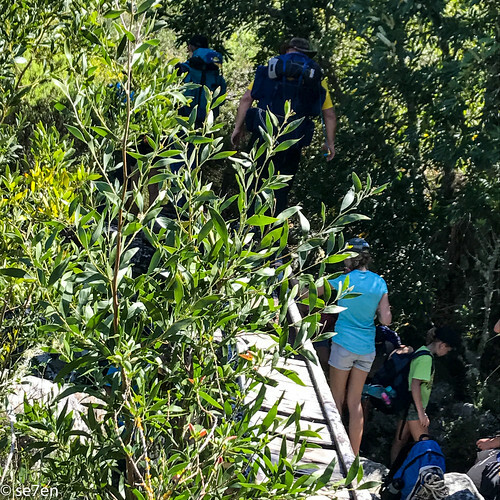 Starting on day one… we headed from Constantia Nek through Orange Kloof, which is a protected area and you may only hike through that area with a permit and an accompanying ranger. This is the only area of Table Mountain that is restricted and there is a fairly stiff fine for those folk who venture in without one. This is a large basin like area of indigenous afro-montaine forest, with access to the back of Table Mountain. 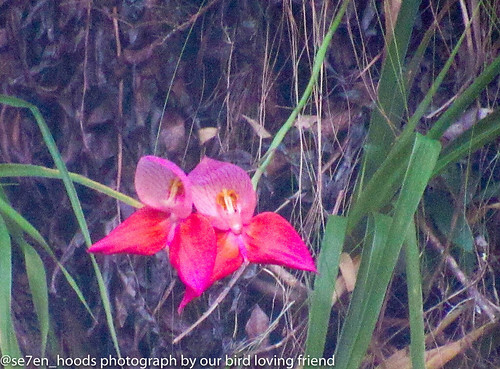 the forest is absolutely beautiful and even in the heart of summer it was a pleasant shady walk. 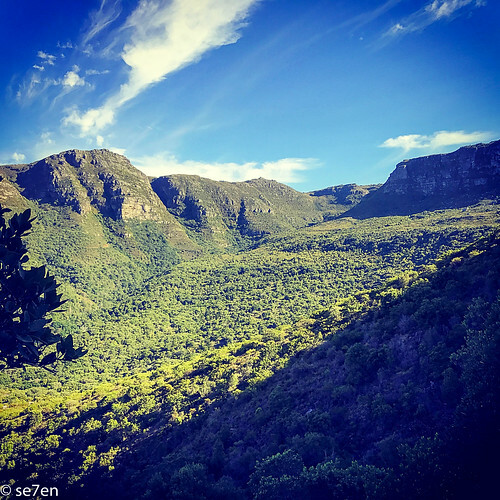 The goal is to get up through the forest and then just past that “still” shady ridge, head up Disa Kloof towards the dams. The path begins on a jeep track, and winds its way above the forest… it is quite unreal to hike through an area where you know you are not going to meet another person and as far as the eye can see there is just natural landscape. After about 45 minutes we turned off the jeep track and headed up a path towards the Woodhead Tunnel and Disa Gorge. 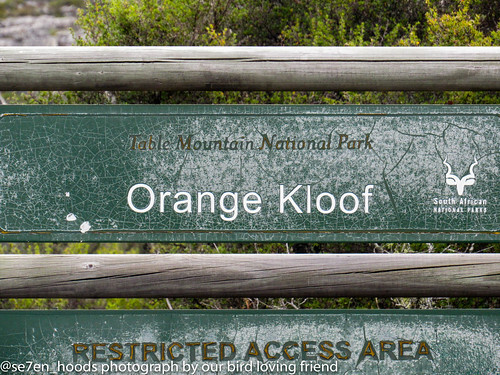 Orange Kloof remains a bit of illusive mystery to so many folk, who have asked us about hiking there and more than a handful of optimistic hikers on the day that were turned back at the start and at the finish, because they didn’t have a permit. The start of the tunnel that goes right through the mountain… who knew! The path that leads up to the Disa Gorge, takes a sharp turn to get up to the Woodhead dam and from there we took a small side path, down to the famous Wood Head Tunnel itself. 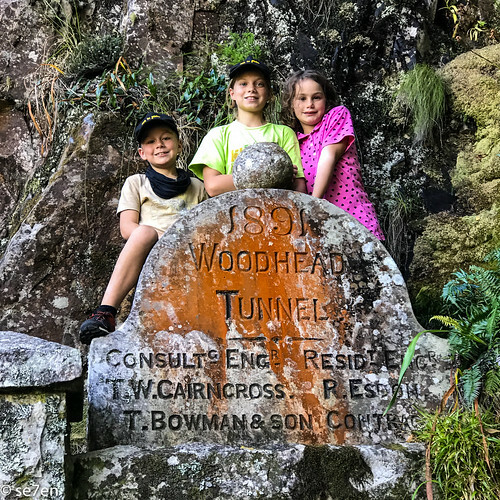 To get to the Woodhead Tunnel we had to cross over or walk over a really rickety bridge… I had already decided before we left home that I was going to do absolutely everything that the hike through at me… so over I went. There is a lovely little area at the start of the Wood Head Tunnel absolutely perfect for a cool shady picnic on a hot day. All the while our Ranger, Justin, was telling us the history of the area and how in the late 1800’s Cape Town was in dire need of a fresh water supply and so they decided to pipe the water from the top of Table Mountain, that was flowing into Disa River of Hout Bay, and divert it through the mountain to Kloof Nek, where it is piped on to Molteno Dam in the city. The tunnel was completed in 1891, and travels approximately 700 m through the mountain. 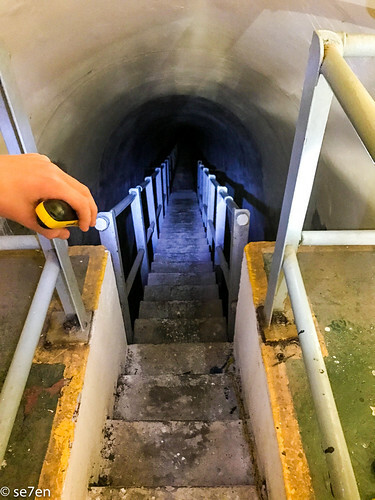 Once the tunnel was built they realised that they would need a reservoir to protect their water supply over the summer months and work on the Woodhead Reservoir began. They soon realised that one reservoir wouldn’t be enough and work on the Hely-Hutchinson Reservoir began. Part of the way up the Gorge we took another little detour to take a look at a second tunnel through the mountains, The Apostle’s Tunnel, that was constructed in about 1960, when problems with the infrastructure of the Woodhead Tunnel, which had collapsed in places, started to interfere with the water flow. This tunnel was completed in 1966. We did this hike at the beginning of my gym journey and would say it is a moderate hike. I think for familys with small children you may want to wait a while… it is totally doable there is nothing technical or difficult about it, but it is fairly long and uphill. As for routes up Table Mountain, it is possibly the easiest and the nicest one that we have done. That being said, we took it really slowly… in fact we took most of the day… with plenty of stops and rests… and it really helped to have a qualified ranger and tour guide to tell us amazing and fascinating facts and keep everyone together and in good spirits all the way up. It was welcome relief to get to the base of the Woodhead Dam wall and know that we were almost at the end of our hike for the day. Finally made it to the Woodhead dam and our overnight was a few hundred meters away from it. At the end of our hike for Day 1, we headed straight for our overnight hut, The People’s Hut and settled in and rested for an hour or two… before heading out for an evening walk. The people’s hut is a well equipped hut, spacious, clean and full of all sorts of things that we would have completely forgotten to pack. Basically we took up sleeping bags, and food for two days… but the rest of it is all supplied. The kitchen is well equipped with pots and pans… all great catering sizes that totally worked for our family that had expanded somewhat with the kids bringing along friends. Otherwise there are bathrooms, there was no water in the hut while we were there, but there was a tank of water so we could flush the loos, and replenish our water bottles. 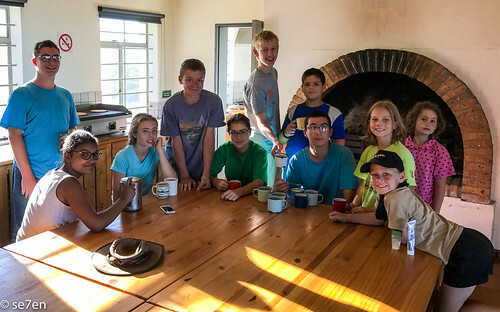 There is a large open deck for watching wildlife and the stars and the incredible view, an enclosed stoep for when the weather isn’t great and inside the hut a large open lounge area to relax in. 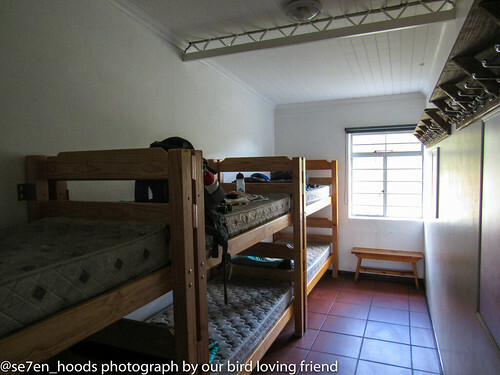 The hut has bedrooms, with bunk beds and comfy mattresses as well as sleeping bags available. We took our own sleeping bags but these would have been handy had the weather changed. They also supply toilet paper and washing up liquid, and wood for your fire. 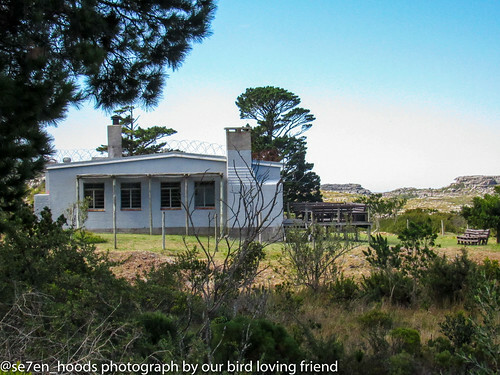 There is also an enclosed braai, perfect for summer nights as well as a fresh pile of braaiwood. And a gas stovetop for quickly boiling water… for essentials like bedtime hot chocolate and morning coffee. 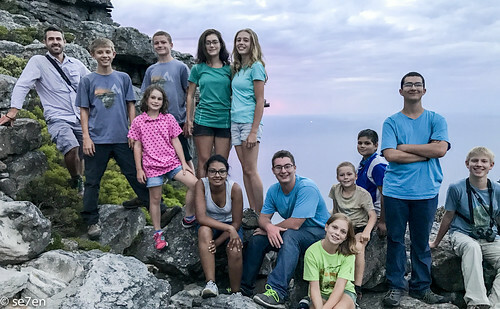 I have to say there is limited wifi on the tippy top of Table Mountain, and our teens found that the only way to connect was to stand on tip toes on the top of a rocky outcrop about 500m from the hut we were staying in. Otherwise the top of Table Mountain was surprisingly busy, not crowded mind you… but there were plenty of folk around. Apart from the hut we were in there is a Mountain Club of South Africa hut, as well as a Scout Hut and because we hiked over a public holiday all the huts were full. Towards evening we had recovered enough to take another walk across the top of Table Mountain to watch the sunset over Bakoven and Camps Bay from the top of Kasteelspoort. Is there anything more beautiful than a hike across the top of Table Mountain at sunset. On the way to our sunset lookout we took a detour and a little scramble… I would just like to publicly announce that I went through a cave… Just saying, let the record reflect… that I went through a cave. 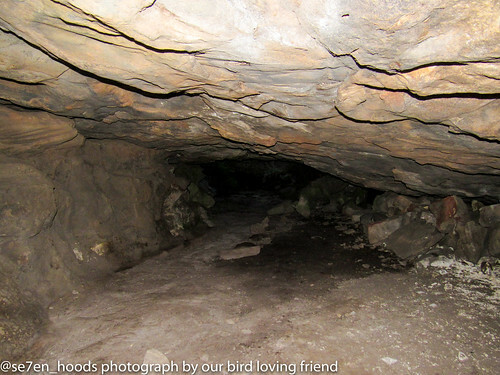 I will admit that it was fairly large, no crawling (just no)… but there was crouching down in the pitch dark and a couple of moments when one couldn’t see either end of the tunnelling cave. It was an achievement, and I was fairly thrilled to see the light of day on the far side. 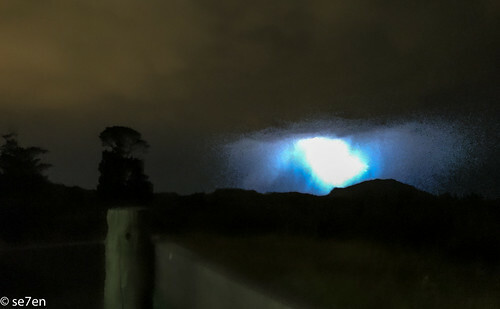 After watching the light change from bright, to glorious pink then purple… we were witness to the most spectacular lightening storm over the ocean. I need to learn how to photograph lightening… just saying!!! 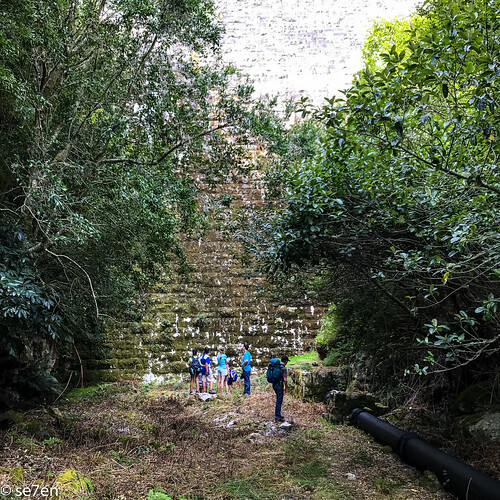 During the time of the construction of the Woodhead Dam and pipelines that learnt about on the first day of our hike… a number of workers lived on the top of Table Mountain, they carried all their equipment and gear up the Kasteelspoort ravine. In fact, they constructed a small cable car to help them carry their heavy equipment up the mountain and traces of their cable car system can still be seen today, they then used a small locomotive to transport their equipment across the top of the mountain, to their small settlement and to the worksite for the reservoirs. 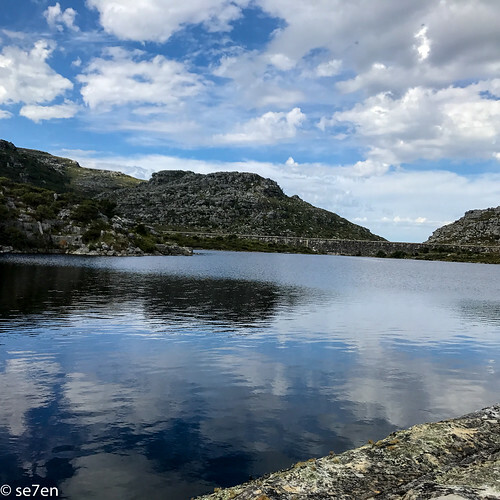 Finally in the early 1900s the City of Cape Town realised that they could not keep up with the city’s water needs, and they had to look for an alternative water supply… and they focused their attention on the Steenbras dam, where water is piped in from over 80 km away. 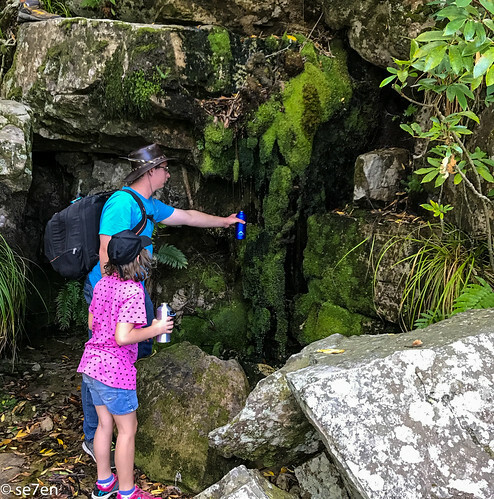 You can learn more about the history of the construction of the dams and Cape Town’s water supply at the WaterWorks Museum on top pf Table Mountain… really there is a museum there, with a locomotive, some interesting artefacts and old photographs to look at. It is a welcome shady rest spot on a hot day of hiking. 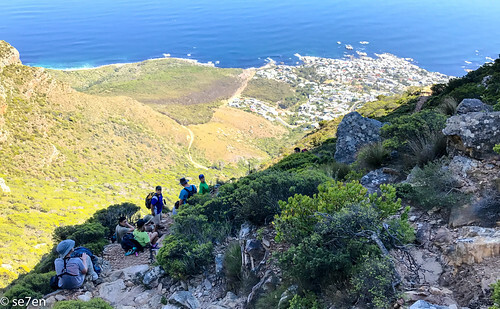 The People’s Hike is designed to take you across the top of Table Mountain and down Platteklip Gorge… a very popular hike, but not an easy one as it is a long long long flight of stairs down the front of Table Mountain and very hot weather was predicted for the day. 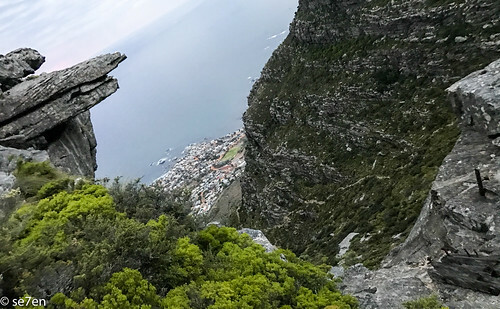 So we opted for the shadier route of Kasteel’s Poort, which we were familiar with because we hiked up there two years ago on our annual Table Mountain Pilgrimage. 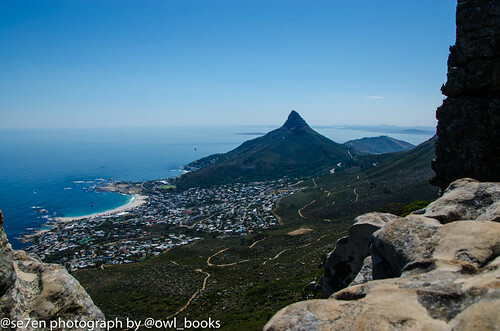 We took a bit of a wander on the top of Table Mountain, in the cool of the morning and then headed down Kasteel’s Poort. It was pleasant and lovely and I cannot imagine how we got up it in the past, but we did. We made it to this lovely outcrop in the shade, at which stage we met the Mid-day sun and as the weather predicted it was extremely hot, close to 40 degrees Celsius, and the quick walk down to the jeep track and on to the finish took us about two hours of staggering from one patch of shade to another. 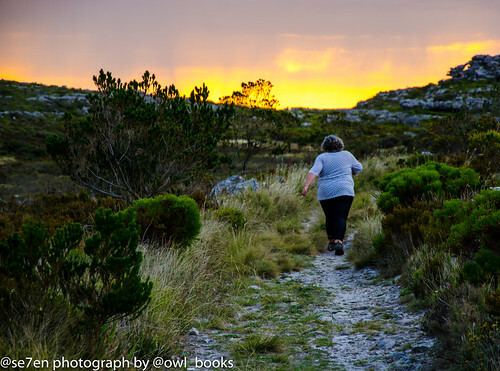 Surprisingly we were passed by a number of visitors to Cape Town heading up the mountain, with little to no water… and it was a relief to see that they nearly all turned back a little way after passing our bedraggled party and headed down again. Some days are just not meant for exertion. We looked forward to this hike for so long, with great anticipation and we were all sorry it was over so soon. Would we do it again, in a flash. I have to say that the first time you do a particular hike is the hardest, it helps to know your way around a route and what to expect. And now that I am so much fitter I know that I would handle this hike so much better myself. 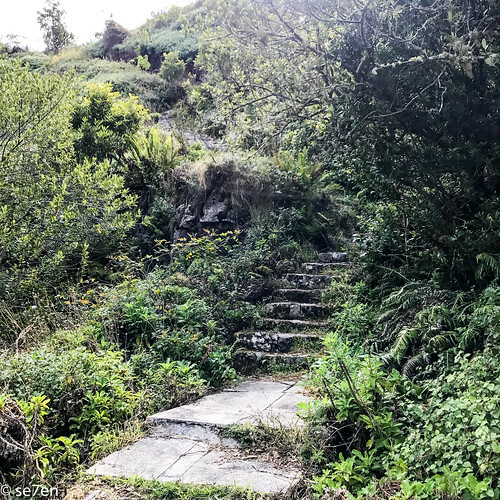 This hike does require a fair amount of fitness… but as for overnight hikes. It was our first and the first time that we had to toss a sleeping bag into our packs… and it just made it so much better than our usual day hikes. 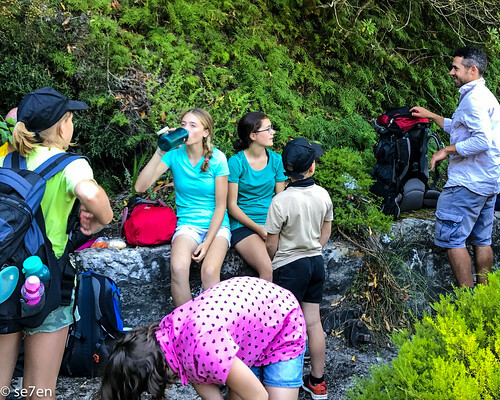 I would encourage you, if you have some day hiking skills with your family and kids, then take the leap and tackle an overnight hike. Really all we had to do was add sleeping bags to our packs and we were ready to go and it totally upped the adventure aspect of getting outdoors to new heights for all of us!!! 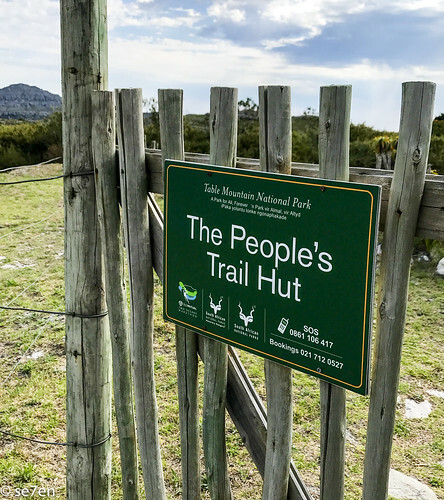 All the information the you need for the People’s Trail is available on the SanParks Website here. 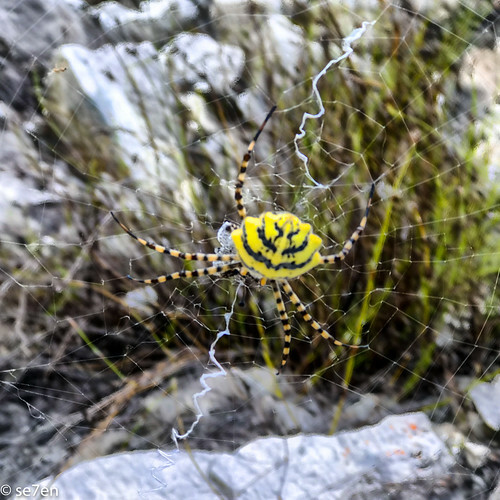 and of course a huge thank you to our volunteer ranger, Justin Hawthorne from Table Mountain Treks and Tours who we cannot recommend highly enough. 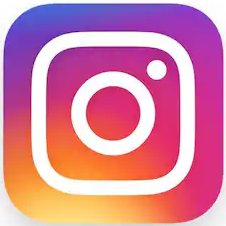 Wow, what a wonderful adventure! A.maz.ing! I loved reading this and seeing all the glorious views. Hmm, might need to put on my bucket list (after a bit of time back at gym!). Hay dvs, it was a fantastic adventure. 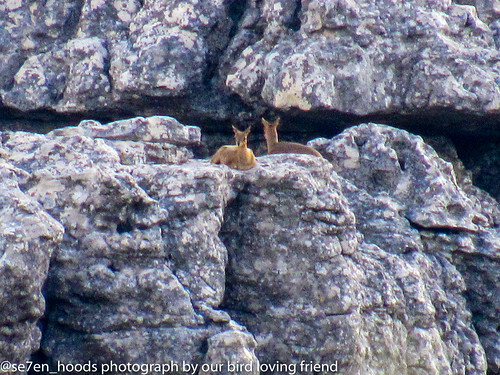 Everyone is thrilled to say that they have slept on the the top of Table Mountain… its a genuine thing!!! Hope you have a fabulous weekend!!! Hay Debbie… it was epic, and you could totally do it!!! And get it onto your bucket list already… your family would love it!!! Hope you have a great weekend!! !